Asparagus, Courgettes, Sweetcorn, Celery, Marrows, Leeks and Pac Choi. By working closely with customers at the design stage we can then build machines tailored to suit the particular needs shown here. The Harvester which can cover up to 25 metres at one time are specially designed for team picking. Also crates are kept off the floor to keep them clean and reduce manual carrying. 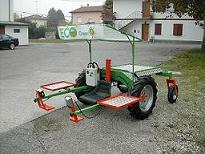 The Ecogreen harvester operates electrically which means there are no emissions, includes an on board battery charger. It can carry up to 200 kilos worth of produce and has substantial size tyres to ensure deep mud is not a problem. Ecogreen allows you harvest your asparagus in a cost and time efficient manner. Call Andy for more information and costs.